Image Transfer Review: This 1.85:1 anamorphic widescreen transfer is virtually identical to the look of the previous DVD. Images are sharp and detailed for the most part, but a bit of softness does appear from time to time. The colors are nice, but nothing special, however, there wasn't any bleeding or other discrepancies to annoy. Shadow and black levels were handled well and precisely, especially during the night sequences. Audio Transfer Review: There is a pair of audio options, but the Dolby Digital 5.1 gets the nod over the low-key, 2.0 mix. This is a basic comedic soundtrack that is heavy on upbeat music that makes its presence felt on the surround speakers. The dialogue is never overcome by this music, and each funny line is crisp and always easy to understand. Extras Review: The extras have been stepped up immensely from the earlier DVD release. On Disc 1 there is a selection of previews and an audio commentary track with director Peter Segal. He goes into detail about the location shoot in Toronto, but the best part of the track is when he discusses his affection for Chris Farley. Disc 2 features the rest of the goodies, beginning with four featurettes. 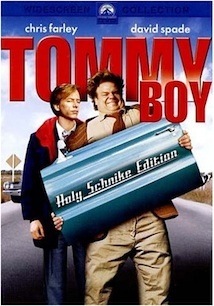 The first, Tommy Boy: Behind the Laughter, runs 29 minutes and takes a comprehensive look at the making of the film. It has new interviews from just about everyone involved, from Segal to David Spade, with much time being spent on their experiences with Farley. Stories from the Side of the Road is 13 minutes long and is full of more new interviews with Segal and company, with most of the focus on the technical aspects of the shoot. Just the Two of Us is a nine-minute mixture of old and new footage of Farley and Spade speaking together. The most moving piece is Growing Up Farley, a seven-minute look at the Farley brothers, Chris, Kevin, and John. Kevin and John reflect on what it was like growing up together, and spend much of the time poking fun at Chris instead of focusing on his death, which is nice to see. A collection of storyboard comparisons provide an in-depth look at seven different scenes. Twenty-seven Additional Scenes feature a nice blend of bits that were cut completely out of the film and those that were Alternate Takes or Extended Scenes. This is followed by a hilarious, four-minute gag reel, featuring Farley at his funniest. Things finish up with a photo gallery, 19 TV spots, and the original theatrical trailer. Finally getting its proper due on DVD, this two-disc Holy Schnike Edition is a rare, easy decision whether to double-dip on a movie. Even if you have the previous, single-disc edition, a true fan of the film owes it to themselves to pick this one up. The audio and video presentations don't improve much over the first release, but there are many more extras this time around.